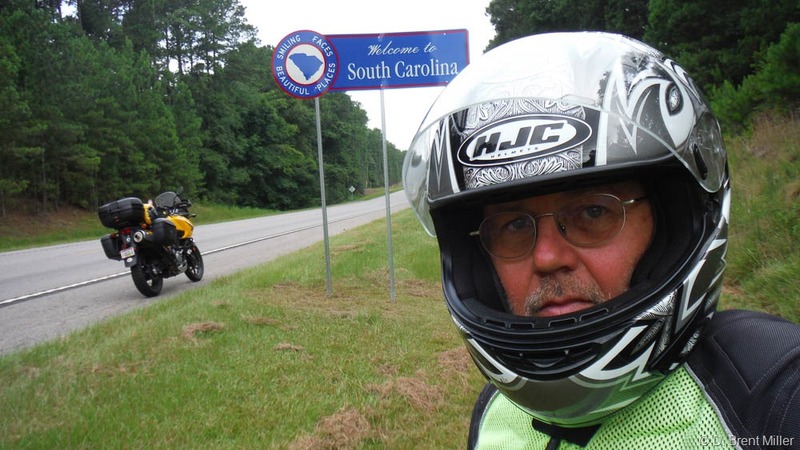 The day started out as a beautiful ride from Augusta, Georgia, and it didn’t take long to complete my mission: fill in all the states of the Southeast. South Carolina was the last one. I actually had been in North Carolina last year when I attended the Horizons Unlimited event. About 11 a.m., I stopped for a break and a snack, and to check weather. It did not look good. There was an awful lot of green and yellow and red on the radar over the Smokey Mountains. I made a decision to head for home via the west side by scooting over to I-75 and then riding north. It was a good plan but I still got caught in the rain. In and out of the rain and mostly in for about four hours. There was a couple of spots where it just poured hard. By 4 p.m., my feet were wet because my old waterproof boots had failed. I could feel the water under my rain pants—they failed. My gloves were soaked. My upper torso was pretty much dry. So, I’m wet and tired. I decided to reserve a place to stop a little north of Knoxville where I could get dried out and rest for the final leg home. After all what more could happen? You know that old cliché’, how can you tell if the biker is happy? By the bugs on his teeth. HA. Okay, the reality is that riding with a visor up means there will be occasional bug strikes. Once in a great while, they have stingers. I was on I-75 doing 70 mph in traffic when something bounced off the edge of my helmet and went up under my glasses. I could see its outline as big and black. Then the burn came. I tried to remove it from under my glasses, and it took a couple of tries. Later, I would learn I was stung twice immediately under the eye and just above the cheek bone. It still burns as I write this, and I have some hydrocortisone on it. Motorcycling lets you get up close and personal with nature whether you like it or not. There is one more day of riding—the ride home. I have done a lot of soul searching on this ride, and there are changes in the wind. I’ll speak more about that after I get home. Here is the new map. 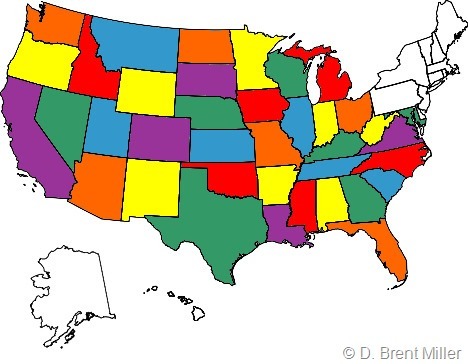 I have visited all these states on a motorcycle. That’s a lot of miles.